I’ve got a quick review of a free e-book released yesterday, full of inspiring words which may encourage those who received their exam results in Scotland last week and those getting A-Level results today, particularly if things haven’t gone as well as hoped. Although, as we know, what teen ever listens to well-intentioned advice! As I was going to see Joanna Cannon at the Edinburgh Book Festival yesterday, I downloaded it and read it on the bus on the way there. The book has diverse pieces of advice of varying lengths from, among others, authors, publishers, journalists, medical staff – oh and Joanna Cannon’s mum! Some will make you laugh, some will move you and I expect many will have you nodding in recognition. Just to highlight a few: I was quite surprised to read Hannah Beckerman’s piece to her younger self who had been rather unsure and depressed. One of her pieces of advice was that comparing yourself to other people will never make you happy. Just the day before I’d watched her calmly interview a successful author (Louis de Bernieres) in front of a huge crowd at the Edinburgh Book Festival. It was good to see that the insecure young Hannah had turned into someone with this kind of confidence. The very first piece is by consultant psychiatrist Ignasi Agell and his final piece of advice is so simple yet can make such a difference in the world – “just be kind”. Count your blessings. There will always be people better off or worse off than you. Recognise all the goodness in your life. These things are health, love and life. Almost everyone says to try to be more confident, something which is so hard in your younger years, and to try not to compare yourself with others. These are lessons which often only come with hindsight. Interestingly almost nobody says ‘don’t do this particular thing’ to their younger self. I think this recognises that all our experiences, good or bad, make us the person we are. 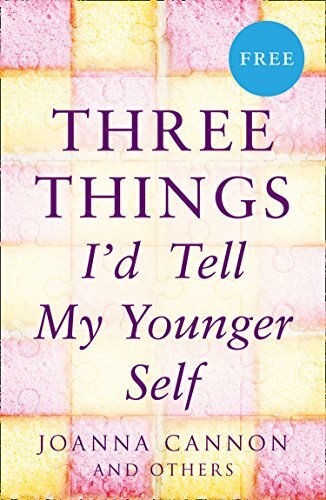 At the end, you will find the opening chapter of the wonderful Three Things About Elsie to give you a flavour of the book if you haven’t already read it. What are my three things? 1 – Not getting the grades you wanted at Highers was a good thing really. You wouldn’t have coped with or enjoyed the Uni course you originally wanted as much as the one you did. 3 – Wear what you like, don’t worry about what everyone else is wearing. Have your own style and forget about the size on clothes. Wear what makes you feel good. Oh and as Janet Ellis says – don’t buy shoes that don’t fit!